Hipstamatic brings back Wicker Park HipstaPak – This weekend only! An update showed on my iPhone for Hipstamatic. Nothing special was listed. But, looking around there is a few new options and old friends are back. A HipstaPak that was pulled a while ago, has returned to buy for those folks that missed the chance before. The Pak, Wicker Park, is a lens, flash and case (digital, not physical case). The lens is the Lucas AB2 which is popular for adding a brown glow to photos taken with it. Like I mentioned in the opening, the developers are trying to add some excitement to the Wicker Park pak as it is only available to purchase this weekend from within the shopping cart area of the iPhone Hipstamatic app. When in the cart area of Hipstamatic, I noticed a new 99 cent (US) offering called PopTone CasePak. The new Pak in Hipstamatic is ‘cases’ for your fun. 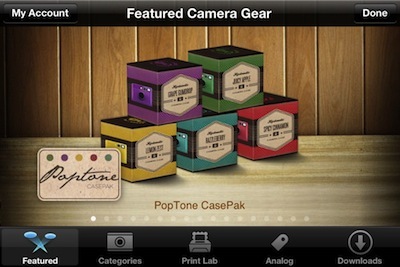 Like the rustic case in the Wicker Park Pak, PopTone CasePak is a group of 5 cases that really pop with bright colors. They don’t change the functioning features of Hipstamatic, they are just for personalization and a lot of fun.